Mermaid’s poignant adaptation of Guess How Much I Love You & I Love My Little Storybook is slated for further international adventures. The company will return to the People’s Republic of China on November 4, 2016 to introduce its acclaimed production to audiences in Ningbo, Nanjing and Suzhou prior to a six-performance engagement at the Shanghai Children’s Art Theatre from November 11-13, 2016. The Shanghai Cultural Exchange Agency has facilitated arrangements for the engagement. 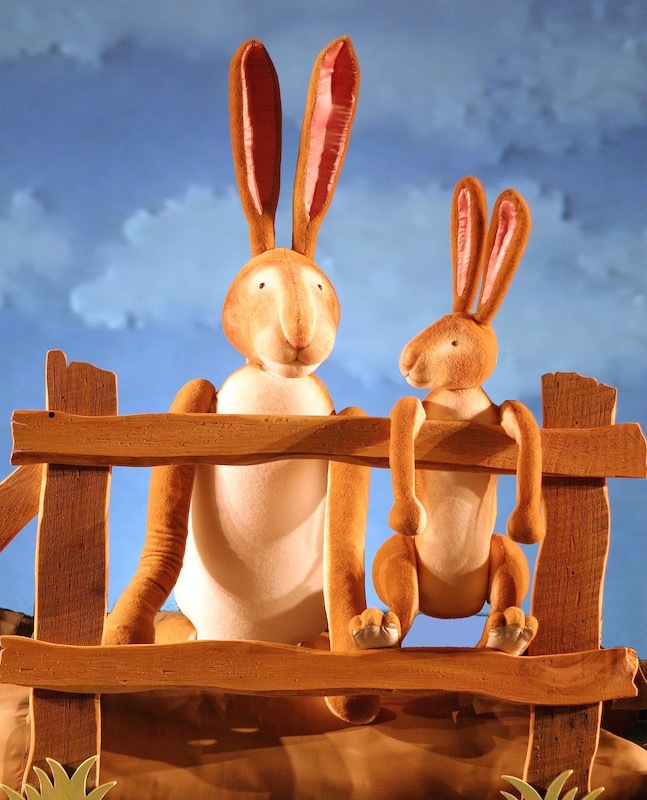 First launched in 2004, the double bill has been termed “a magical, meditative experience.” Sam McBratney’s touching bedtime account of Little Nutbrown Hare, Guess How Much I Love You, has appeared in 53 languages, with more than 28 million copies in print worldwide since its publication in 1995. A second beloved story, I Love My Little Storybook by writer/illustrator Anita Jeram, features a whimsical menagerie of animals and imaginary creatures and celebrates the joy of reading. Jim Morrow served as both director and production designer while Steven Naylor’s lively music score reflects the Celtic traditions shared by Nova Scotia and the stories’ creators. The Mandarin–language version features recorded narration by Dashan (Mark Rowswell), the Canadian-born stage and television performer acknowledged as the most famous foreign artist in China. Touring artists include puppeteers Jeffrey O’Hara, Katie Dorian and stage manager Jessica Lewis. Jim Morrow will travel with the company, and oversee puppetry workshops offered in conjunction with Mermaid’s appearances. The tour is supported with assistance from Arts Nova Scotia, The Nova Scotia Creative Industries Fund and Support4Culture. A further six-week engagement is anticipated for the summer of 2017. Founded in 1972 and based in rural Nova Scotia, Mermaid Theatre of Nova Scotia is currently Canada’s most widely travelled performing arts company for young spectators. Simultaneous tours enable the company to perform on several continents on the same day, so that Mermaid Theatre’s circuit continues to make theatre history at home and abroad. Last October, we posted a portion of an (email) interview with our Artistic Director, Jim Morrow. That portion of the interview is available here. The remainder of his questions and answers are printed below. Q: What type of puppets do you use in your performances? Who creates them? A: We are not a puppet company in the classic sense but a company that incorporates objects to tell stories. The objects that are more fully realized (with eyes, mouths, hands and feet, for example) we call our puppets. We have used traditional styles (hand, rod, marionettes or stringed, body, mouth or Muppet, and shadow) in past shows but design decisions are almost always based more on the unique challenges associated with adapting well known storybook characters into fully realized objects rather than on a particular puppet tradition. Essentially we first carve objects, or sculptures, and then learn how to move them through space by experimenting. Some of these sculptures have rods or strings incorporated and, as such, are considered traditional puppet styles but there can exist in any given play, many styles of puppets that are both traditional and new. There are no books we can refer to discover how to move these objects. We simply have to study and learn through experimenting and trial and error. Q: Who composes the music you incorporate into your performances? A: Music is a fundamental component of each Mermaid show and is a primary consideration from the early stages of development to completion. Music not only provides the requisite beat and rhythm that compliment the action but also adds a layer of emotional texturing that underscores each moment throughout the play. Steven Naylor is our principal sound designer and composer and we have been very fortunate to include his considerable skill and knowledge in our creative process for a very long time. Q: Can you tell us more about the Institute of Puppetry Arts? A: Mermaid’s Institute of Puppetry Arts was created to provide training opportunities for anyone with an interest in learning the art of object movement and puppetry. Since the company’s inception forty-four years ago, puppetry has maintained a fundamental role in the development of each new play, and it has been integral in securing Mermaid’s unique place in the ecology of theatre for young audiences in North America and beyond. Workshops: Through a variety of workshops, carefully crafted to serve the needs of both the general public and a theatre community increasingly curious about puppet construction and manipulation techniques, and with experts who are well versed in all aspects of puppet instruction, we annually reach hundreds of children and adults alike, both here at home and abroad. Puppetry instruction is also evolving in theatre programs offered by institutes and universities, where there is a growing curiosity about the medium and its application to core training. Animotion: Our professional training session, called Animotion, is now recognized as one of the premier puppet instruction destinations in North America. The three-week long Intensive takes place each spring at our headquarters in Windsor and brings together ten participants from around the continent, most with limited knowledge of, or experience in, puppetry and object theatre. Each session is guided by a series of exercises designed to gently ease the participants from the early stages of learning the rudiments of manipulation, to fully realized moments complete with home made puppets and music. Play Creation: The Institute of Puppetry Arts also boasts a play-creation component, with an emphasis on one-hour curriculum-based theatre pieces designed specifically for presentation in school auditoria. Developed collaboratively with specialists in the field of conservation biology and teachers of science, to date we have created two interactive productions that deal with issues relating to underwater marine biology (Sunken Treasures), and species at risk (Code Green). Mermaid Theatre is back on the road again. One company is in Ireland this month, performing Guess How Much I Love You & I Love My Little Storybook at the Baboró International Children’s Festival in Galway from Oct 15-18, with additional outreach performances at the Hawkswell Theatre in Sligo on Oct 23-24 and the Pavilion Theatre in Dun Laoghaire on Oct 26-27. Our Goodnight Moon & The Runaway Bunny show is touring the US and Canada now until May, 2016. The schedule of performance is on our website at mermaidtheatre.ca/ontour. Q: How do your performances “introduce family audiences at home and abroad to the excitement of theatre and the performing arts”? A: I think Mermaid Theatre is unique in the world of theatre for young audiences. Unlike many other companies, all our shows are adaptations of well-known storybooks that very young children learning to read. We do this because we not only promote excellence in children’s theatre but also promote literature and the joy of reading. It’s a very special feeling to witness a young child clutching his or her favourite book as they enter the theatre to see their favourite characters come to life on stage for the very first time. Our shows are also very detailed, elegant, and gently paced to allow the mind of the child to interact appropriately with the action onstage. And we use puppets which heighten the playfulness of our shows. Q: How do you encourage literacy and the love of reading? A: Our companies mission is to adapt universally well-known stories, by some of the world’s best-known authors, into theatre productions that tour around the globe. We have been very fortunate to have the opportunity to adapt some of the best including: The Very Hungry Caterpillar; Guess How Much I Love You; Swimmy/Frederick/Inch By Inch; Goodnight Moon; and Stella, Queen of the Snow. The challenge for theatre creators, regardless whether their plays are adaptations or original concepts, is to produce work that it is elegant, entertaining, and of quality. Q: How do you select which children’s books to bring to the stage? A: The very first consideration when choosing a storybook is whether the story itself is appealing to children. Most successful books written for the very young are penned, and often illustrated, by adults who have very special insights into what young children like and how the young mind thinks. These books often include simple text, evocative pictures, and defined characters that are easily relatable. In many of the most successful stories, the message, if there is one, is most often implied and, although an important consideration, it’s often a secondary to the story itself. Masterful children’s authors, and there are many, are able to evoke a sense of wonder and awe through elegant storytelling, delightful pictures, and memorable characters. Stories, pictures, and characters that children want to visit again and again, night after night. Many of these stories also make good plays. Q: How did you decide to bring Goodnight Moon and The Runaway Bunny to the stage specifically? A: Goodnight Moon and The Runaway Bunny are two books that have survived the test of time and are considered modern classics. Millions of people around the world have enjoyed the playful antics of Margaret Wise Brown and Clement Hurd’s little bunnies so it was a thrill to have the opportunity to adapt these stories and bring them to life, onstage. Generations of children, and adults alike, have imagined these iconic characters hopping around the outdoors and in the Great Green Room, so it was also a particular challenge to interpret them in a manner that was both appropriate and satisfying to most readers. Q: Many of your audience members have never seen a theatre performance before. How do they react? A: It’s been my experience that audiences all over the world respond, more or less the same to our productions, especially the children. I believe they respond positively to the bright colours, the playful action, the recognizable characters and imagery, and the beautiful music – but mostly they are happy simply to be with friends and family, in the theatre, and to have an opportunity to laugh and shout and be entertained. We’ll offer more of this Q&A at a later date…Have a great weekend!